In our Research Spotlight series, I spend some time with these AI team members for in-depth conversations about their experiences and get a peek into what they’re working on at AWS. Anima Anandkumar joined AWS in November 2016, as Principal Scientist on Deep Learning. 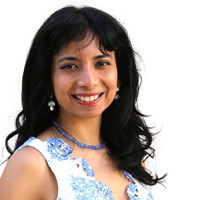 She is currently on leave from the EECS Department at UC Irvine, where she has been an associate professor since August 2010. Anima has earned several prestigious awards, including the Alfred P. Sloan Research Fellowship, the NSF CAREER award, and Young Investigator Research awards from the Army Research Office and the Air Force Office for Sponsored Research. Her research interests include large-scale machine learning, non-convex optimization, and high-dimensional statistics. In particular, she’s been spearheading the development and analysis of tensor algorithms. “My mission is to make machine learning accessible to everyone on the planet, and AWS is an awesome place to achieve that.” She went on to explain that she wants to remove the guesswork for launching large-scale machine learning jobs, so that you don’t have to be an expert in machine learning, application domains, or programming, especially because it’s humanly impossible for one person to have all these skill sets. As Anima notes, there is a huge gap between formulating theories and going into production with a machine learning workload. Her goal is to shrink the gap from prototyping to deployment. One of the tools that Anima plans to work with is Apache MXNet. She wants to add a lot more functionality to exploit Apache MXNet’s programmability and ease of use. “Our roadmap includes operations that surpass the existing deep learning framework. We want to develop multi-modal processing algorithms.” Multi-modal processing allows an algorithm to simultaneously process text, images, and other modalities at scale. Anima also keeps herself extremely busy as a spokesperson for AWS. In January, she presented at Applied Machine Learning Days at the EPFL in Switzerland. In February, Anima presented at the Anita Borg Institute in Seattle on Distributed Deep Learning. For International Women’s Day, Anima was celebrated as one of 33 women in data science along with Ada Lovelace and Grace Hopper. In March, O’Reilly hosted a podcast with Anima on deep learning and she presented at Strata + Hadoop World in San Jose on Distributed Deep Learning on MXNet. You will also find her on the agenda for the May 2017 Strata + Hadoop World in London. Anima recently accepted an offer from Caltech to be an endowed chair professor, beginning in the fall of 2018, for their Decision, Optimization, and Learning research group (DOLCIT). While dividing her time between Caltech and AWS, Anima hopes to build a strong partnership to cultivate the organizations’ complementary strengths, and to enable collaboration that leads to innovations in machine learning. In her free time, Anima loves to dance in a variety of forms and travel to far-flung places. Her most recent adventure, in Patagonia, involved riding horses in the Patagonian steppes, hiking the Torres del Paine, and kayaking and swimming in glacier lakes. Victoria Kouyoumjian is a Sr. Product Marketing Manager for the AWS AI portfolio of services which includes Amazon Lex, Amazon Polly, and Amazon Rekognition, as well the AWS marketing initiatives with Apache MXNet. She lives in Southern California on an avocado farm and can’t wait until AI can clone her.